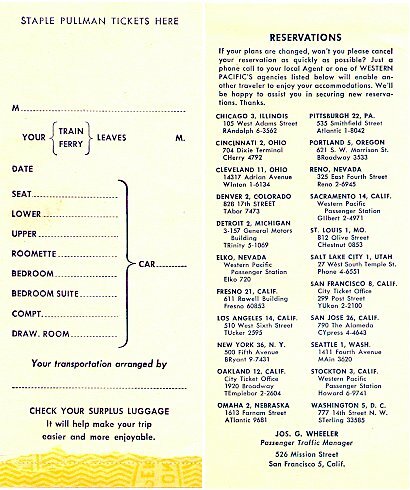 "Welcome" Cards: -- These cards are about the size of a post card (the "early" version having actually been used as one, postmarked in 1956), and I believe they were placed in the passengers' room before they boarded. If you have more information, please let me know. Seat Check -- The seat check would be marked by the conductor with the destination of the passenger occupying a particular coach seat, and then attached to a clip above the seat. 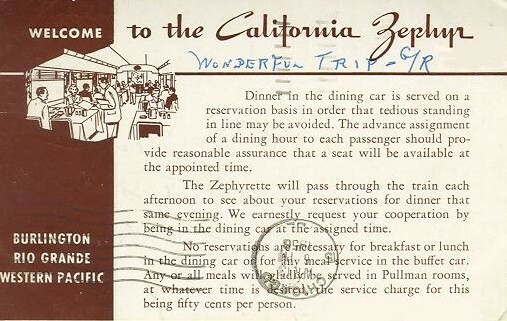 Ticket Folder -- This example was issued by WP. 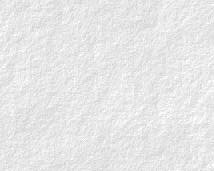 It contained the originally issued tickets from the agent. On the inside cover it also contained car and seat number information. Coach Seat Headrest Cover -- Detail of the embroidery on the headrest cover. 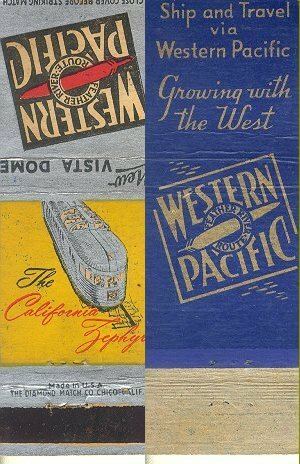 Looking through pictures in the CZ books, there appears to have been two different designs used over the life of the train. 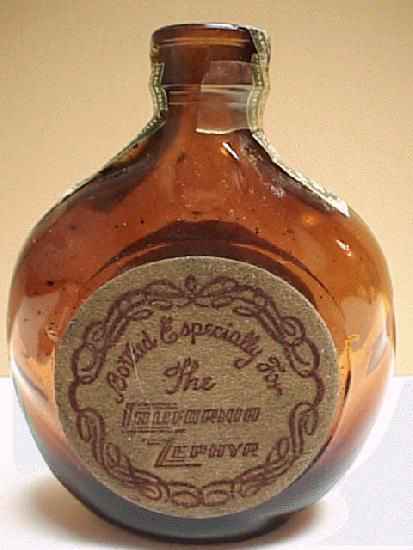 This example appears to be the one used in later years. 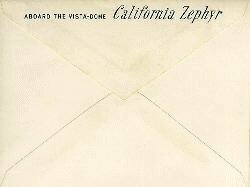 Envelope -- The CZ, like many trains, provided stationary for passengers to write home with. 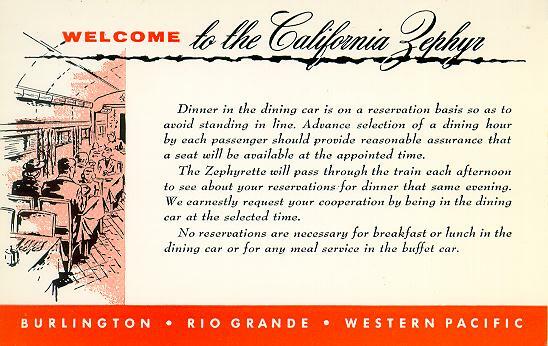 They even provided a writing desk in some of the dome cars! WP Business Envelope -- Detail from the back of a WP internal mail envelope. Note the route of the CZ as including New York...this is the only such instance of this wording that I've seen. Matches -- Silver-covered matches provided for smokers' pleasure. 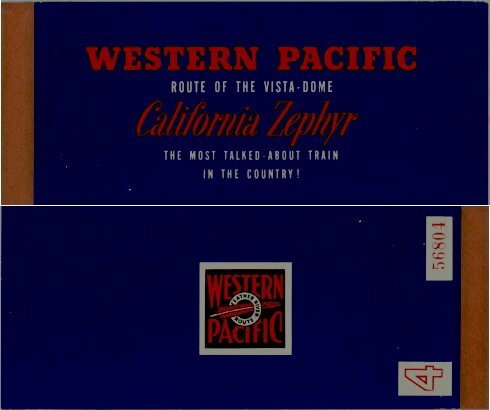 WP matches advertising the "NEW" California Zephyr.